Abelia floribunda is a semi-evergreen shrub originating from Mexico, also known as the Mexican Abelia. 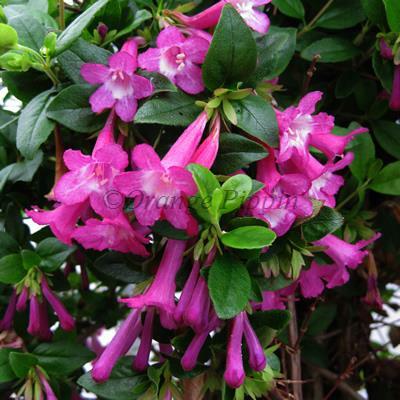 This medium sized, semi-evergreen or evergreen shrub in some areas has shiny green, oval-shaped leaves and produces the most lovely tubular, cerise-pink flowers up to 5cm long in early summer. This eye catching shrub enjoys full sunshine and a sheltered position and dislikes cold, drying winds, so would be best planted in a sunny mixed border or in a container on the patio.